I love seeing stories and reading blogs of people who reduce waste in their home to almost zero waste. I will admit, it seems close to impossible sometimes. Right now, as we work on growing all of our food, we still shop at the grocery stores. We do recycle here at The Green Acre Homestead but it doesn’t always quite feel like enough. Reducing waste doesn’t only come in forms of plastic! You can reduce your plastics waste, paper waste, food waste, etc. 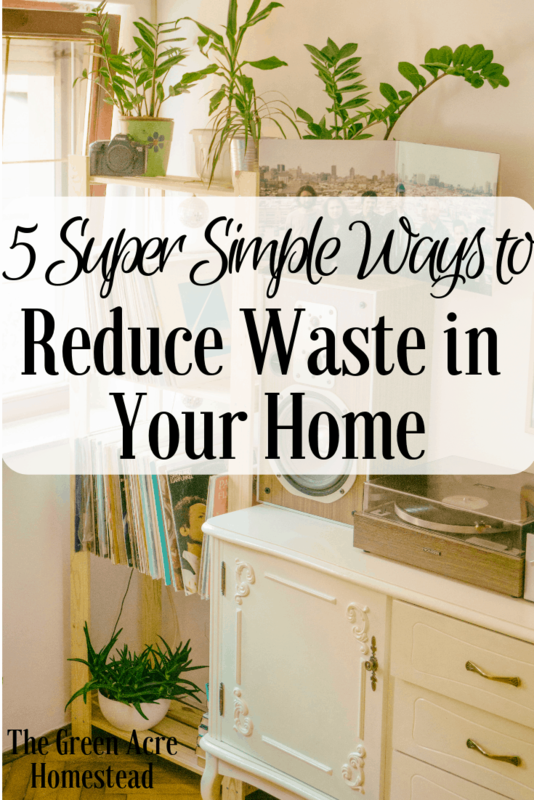 Here are a few, simple things that you can start doing today to reduce waste in your home! Reusable Containers Are Perfect When Reducing Waste In Your Home! Are you planning to buy lettuce at the store? Try and remember to start bringing your own containers to put it in instead of using the little plastic produce bags. This is a great way to reduce waste in your home because you aren’t even taking it there in the first place! The spinach I buy comes in big plastic containers so I always wash and reuse those containers. If I don’t reuse them, I make sure to recycle them. Remember! Reduce, reuse, recycle. Reduce Waste in Your Home Starting With Paper! One of the largest leaps towards no-waste that I’ve taken is getting rid of paper napkins and paper towels. Believe it or not, it was very simple! For the longest time I thought it was going to be the most difficult thing to do but I just simply did it. Really! I used the rest of the paper products and I never bought them again. It’s just my husband and me in the house so it doesn’t add to laundry much. My grandmother sent me some old “official” cloth napkins that we use for meals and I just picked up some cheap wash clothes for all my cleaning needs. You might not believe it, but I really do not miss the paper products. We aren’t yet off tissues, but that’s the next step! You also wouldn’t believe how much waste I reduced in my home by getting rid of paper products! Did you say REUSABLE STRAW? If your house is like my house, you drink a lot of smoothies. We use straws in our smoothies so reusables are a must. We use these. This packet of straws comes with multiple colors, they’re non-toxic and BPA free, and come equipt with a straw brush to clean with! These would be great for children, too, because of all the fun colors. BONUS TIP: You can also buy straws that come with a little carrier that fit right into your purse, pocket, or car so that you can use them while at restaurants, etc. They’re called Hot Straws and you can get them here. I would challenge that this is in the top 5 ways people reduce waste in America. There are full cities that are taking away plastic bags and requiring customers to use reusable ones. This is such a simple, easy action you can take to reducing waste in your home. I have a slew of plastic bags and, although I do reuse them, I do find it outrageous how many I constantly have! I remember my reusable bags 95% of the time (hey, nobody’s perfect) and the other 5% it seems I go to the store for one thing and I leave with five bags. I know families who buy bottles of water for their home and there’s no way to reduce waste that way. We’re on a well and the water’s great so I don’t have any incentive to buy bottles of water. If we weren’t on well water, I would instead opt for a good water filter. You can buy a refillable pitcher and stick right in your refrigerator. Another option is to buy a nice filter that attaches right to your kitchen sink! There are so many steps you can take to help to reduce waste on the homestead. I use my reusable water bottle, recycle, compost, and reuse my feed bags. “Going Green” is the new hip thing to do these days and I’m definitely not complaining about it! The more food we grow the more waste I hope to reduce on our homestead. Composting, gardening, donating clothes, etc. are all great ways to cut down on items sent to the landfill. What are some ways you work to reduce, reuse, and recycle every day? I’d love to hear about them in the comments below! Previous Post: « What Does a Henhouse Need and What’s Just Nice to Have! Visiting from the Simple Homestead Blog Hop. When we started our homestead a couple of years ago, I slowly transitioned all of these into zero waste options and am so glad I did! We have saved not only a large amount of waste from going to the landfill, but also money! I used to purchase bulk size paper towels a couple of times a year. Now I may purchase them ever 18-24 months! We use them on occasion, but the amount of reduction is incredible. It is so easy too! Hi Erin! I totally agree. The paper napkins were the easiest for me to give up! I also always carry reusable straws with me, they’re so small and fit perfectly in any bag I carry so it’s an easy one, too. It definitely saves money reusing items and definitely love the landfill aspect! Thanks for stopping by and I look forward to seeing you next week! I have a produce basket I take with me when purchasing vegetables. I cut up old towels we use in our kitchen instead of paper towels and we never use straws. Cloth napkins are used as well. Start small work way up. Found you on Simple Homestead Blog Hop Link Party. I do all those things, also! I’m glad you were at the hop, I love hosting that hop. I look forward to seeing you next week!